** BUT WHAT ARE THE BELLS ON KANE HALL? 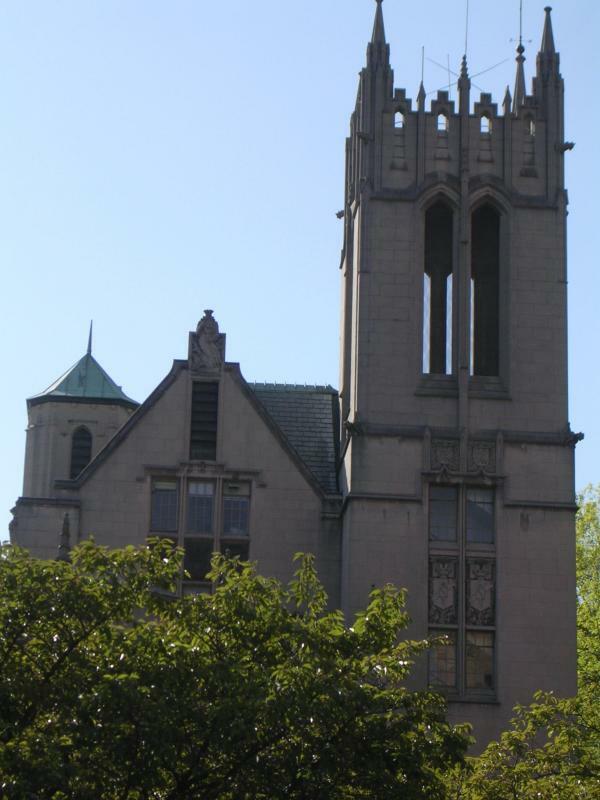 In March 2018 (a decade after the change-ringing bell installation), the Gordon Stuart Peek Foundation installed a second set of bells at UW - a 47-bell Eisjbouts carillon, placed on a tower on Kane Hall. Like the change-ringing bells, the carillon is rung by a human person(s), not by a machine. Unlike the change ringing bells, the carillon is rung by one person (the carillonneur) - the change ringing bells are rung by a team of people (see below). Another key difference is that the carillon plays melodies typically with harmony, while the change ringing bells ring patterns, with each bell sounding separately. For more about carillons, see The Guild of Carillonneurs in North America. For technical information about the UW carillon, see here. 11:20-11:30am on Mondays during term (starting Monday 28th January 2019). and you may sometimes hear the carillonneur practicing, typically on Saturdays between 12:30 and 1pm. In early summer 2008, the first set of change ringing bells on the west coast of the USA were installed on the University of Washington's Seattle campus. The installation is a gift of the Gordon Stuart Peek Foundation. The set of 8 bells, cast by Royal Eisjbouts Bell Foundry in the Netherlands, tenor weight 6 cwt, tenor note B, are hung for full-circle "change" ringing in the tower of Gerberding Hall, on the UW's Red Square. Change ringing - in which a trained team of ringers (the "band") ring the bells in continuously varying patterns (not tunes) - originated in the UK in the 17th century. There are now over 5000 ringing towers in the UK, but only about 40 in the USA (and 8 in Canada), with our nearest ringing neighbours being Vancouver and Victoria in Canada, and Chicago and Abilene (TX) in the USA. The UW bells will be rung (see here for dates and times) to celebrate university, state and national events by a band of volunteer ringers from the UW and the Seattle area. Ringers who are visiting (or have moved to) Seattle are always welcome. If you are ringer, but want to learn to ring, read on and contact us. Generally, the bells may be heard on Friday evenings between 8:30 - 9pm. Out of term, the bells may also ring on Monday evenings between 8:30 -9pm. Also, check the calendar, as we sometimes ring quarter peals on Saturdays or Sundays, usually between 10am and 1pm. Sunday 25th November 2018, from 10:30-11:30am, quarter peal. For our regular practices, see calendar. We also ring for special events. Upcoming events will be listed here and on the calendar. Red Square is an excellent location from which to hear the bells. Throughout the year, the bells will be rung to celebrate university, state, and national events. To request ringing for an event, please contact the Tower Captain. Most of that practice is using a simulator system and is not audible outside the tower, but typically on Friday evenings (and on some Monday evenings out of term), we ring the bells open from 8:30-9pm. If you are already a ringer, you are very welcome to ring with us - please contact the tower captain in advance (at both email addresses above). Sometimes extra practices can be arranged. Except in special circumstances, unfortunately practices are not generally open to non-ringing visitors, but if you are interested in learning to ring, see below. Gerberding Hall is on the south side of UW's Red Square in the central UW campus, just next to Suzzallo Library. We meet at the southeast corner of Red Square before practices. Visiting ringers, please note the building is locked, so please contact us before hand so we don't miss you. Travel to UW: UW is well served by local METRO buses to NE Campus Parkway, the HUB, and Montlake, and the new Link Light Rail from Capitol Hill, Downtown and Sea-Tac. (Google maps is a good way of finding out about transportation options). Click here for walking routes from the bus stops to the tower. If you drive, Pay-parking is available from UW, or on meters on local streets (free after 8pm). For more details about getting to the tower, see here. WANT TO KNOW MORE OR TO LEARN TO RING? Ringing requires about as much coordination as riding a bike, and a similar amount of effort as learning a musical instrument. It is a team activity, producing a musical performance, and a fun and stimulating mental and physical exercise. It is practised worldwide (here's a list of all change ringing towers in the world) by an eclectic group of volunteers of all ages. See, for example, the North American Guild of Change Ringers. Physical requirements are mostly an ability to climb steep ladders, exert some force with your arms above your head, and some degree of rhythm. If you are interested in learning to ring, contact us, and we'll explain more. We teach ringing when we have the opportunity. (Teaching is one-to-one and all our teachers are volunteers). UW persons are particularly encouraged. (If you have contacted us already and not had any reply, it is likely due to a spam filter - please try again!). www.ringing.info for an extensive set of ringing links.